A few weeks ago we had an amazing garlic bread from our local market. 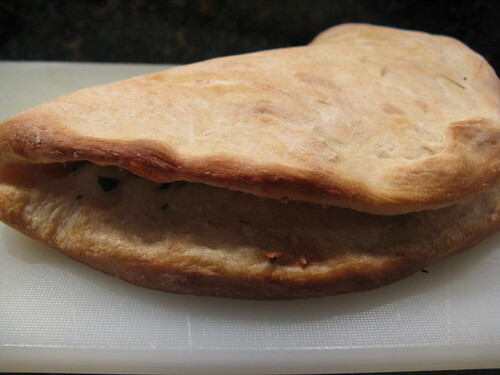 It was a flat bread folded over with the garlic & herbs in the middle. We decided to try making our own version of it using our favorite pizza dough. Oh, was it good! The outside gets crispy while the inside stays soft & chewy. I was afraid the garlic wouldn't cook enough & be too strong but the flavor was perfect. This will be the garlic bread I make from now on. In large mixing bowl, combine the yeast, salt, and spices. Add the water and 1 tablespoons of olive oil and give it a quick stir. Add the flour a cup at a time. When you can't stir in any more flour, switch to kneading it in. Knead until the dough is smooth. If the dough is too sticky add flour in slowly until it smooths out. Pour the 1/2 t olive oil into the bottom of the bowl and roll the dough around until the oil coats the outside of the dough. Cover with a damp cloth and stick the whole bowl out of the way to rise. It should double in about 2 hours. Lightly grease a baking sheet. On the sheet press the dough out to a large circle, about 12-inches. Brush the dough with 1 T olive oil (more is needed to cover the whole round). Sprinkle the garlic & parsley over the oil. Fold the dough over to make a half circle. Bake for 15 minutes of until golden brown. 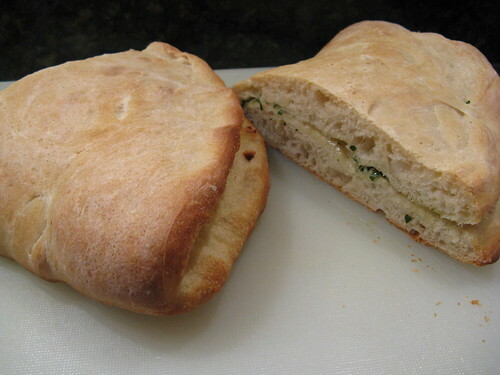 This looks absolutely amazing and satisfies my obsession with both bread and garlic! I just lve this version of garlic bread! I've never seen garlic bread done like this -- looks great! You make such good food, Kat. :) I can't wait to try this, too! I'm a carb-o-holic, so this one is speaking my name! Oooooh, looks great! And I've got everything to make this!